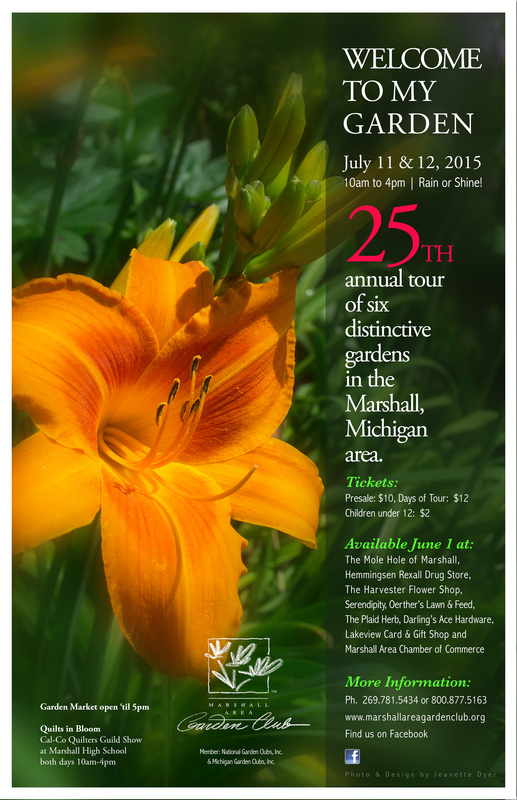 The Marshall Area Garden Club's 25th "Welcome to My Garden" tour is just around the corner . Below is a preview of this year's 6 gardens. 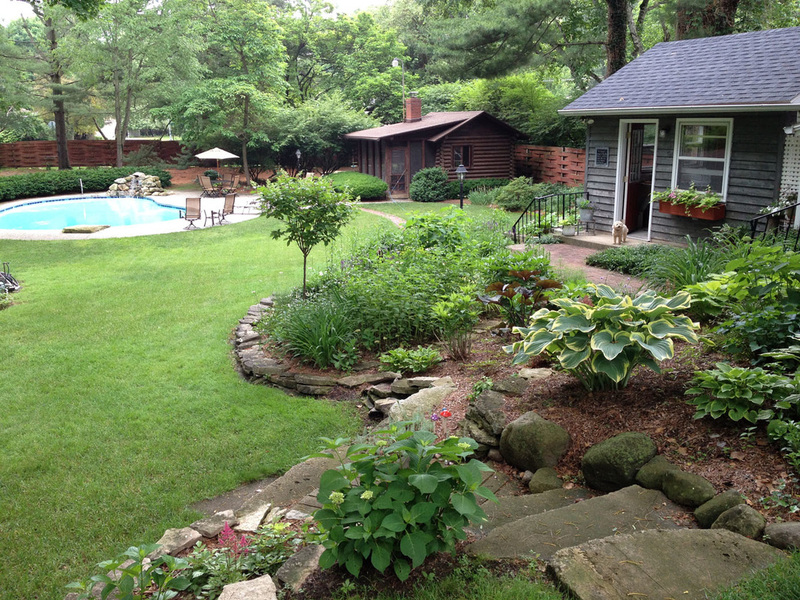 Saturday and Sunday (July 11 and 12) is the 25th annual Marshall Area Garden Club's "Welcome To My Garden" Tour. Hours are 10am-4pm rain or shine both days. On garden tour days tickets may be purchased for $12 at the NE corner of the round about (Fountain Circle). Tickets at a discounted price may be purchased in advance of the tour at the Marshall Welcome Center or from many local merchants. For more information call 269-781-5434 or visit the club website marshallareagardenclub.org Also find the club on Facebook. The gardens range in size from large estate to small City lot and four of the gardens are on tour for the first time. Tour guest will find beautiful collections of perennials, colorful annuals, plants in re-purposed containers, fairy gardens, bamboo, 200 year old Oak Trees, specimen trees and shrubs, pools, ponds, water features, hardscapes, potting sheds, out buildings, outdoor entertainment spaces, restful screened in porches, garden art, statuary, and a log cabin that Win Schuler built in the 1950s, for his card playing and cigar smoking. 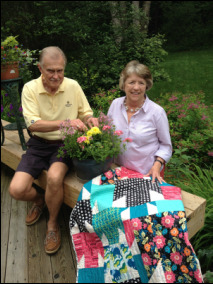 A handmade quilt will be displayed in each of the gardens to highlight the fact that a quilt show is also open to the public at the Marshall High School the same days as the Garden Tour. The proceeds from the tour are used by the Garden Club to fund community projects. The flower plantings around the Fountain Circle and the garden at Carver Park at the East end of the Downtown Area are examples of some Garden Club projects. The objectives of the club stimulate the love of gardening, encourage home and community beautification, promote better horticultural practice, and encourage all forms of conservation. Becky & Matt Samra 609 N. Kalamazoo Ave.
Rosie & Dave Clark, 403 N. Kalamazoo Ave.
Tom Franke, 410 N Eagle St.
Marty & Lucy Overhiser, 215 N. Marshall Ave.
A Garden Market will also be on July 11-12 at 619 S. Marshall Ave. The Market hours are10am-5pm. Shop for an assortment of garden items including plants, honey hoes, t-shirts, art, antiques & accessories. Turn south from E. Michigan Ave. on S. Marshall Ave., and drive 1/2 mile to corner of Fair St. and S. Marshall Ave., located next to the Fairgrounds, behind the B.E. Henry Building. For more information about the Market call 269-781-9291. The Cal-Co Quilters Guild is holding it’s annual show "Quilts In Bloom" both days 10am-4pm at Marshall High School. Includes over 200 quilts, items for sale and a quilt raffle. More information at www.calcoquiltersguild.com. 1. Crosby Garden 609 Ventura Way. This small urban garden is approximately 20 years old, and includes some perennials from their old home in Marshall. Two featured trees are the Dawn Redwood and Witch Hazel. The owners enjoy some statuary and wind chimes. Some of the garden is undeveloped, as the eating habits of surrounding wildlife are a constant challenge. According to the owners, they try something new and different every year with mixed success, but it’s fun to try! 2. Samra Garden 609 N. Kalamazoo Avenue. The deep backyard provides privacy and serenity for this family. Among the centuries-old oak trees are many shade-loving plants and bushes, and a mix of colorful annuals and hardy perennials such as hosta, astilbe, and lilies. The grounds include: a log cabin that the Schuler family added in the 1950s, an eat-in potting shed, and a storage area recently repurposed into a bar for entertaining. 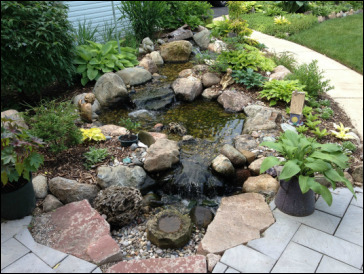 The pool and waterfall add tranquil touches to this spacious yard. 3. Clark Garden 403 N. Kalamazoo Avenue. Only 5 years old, this city garden provides a soothing and relaxing space for the owners. Large hostas are among their favorites, and many are “babies” from mother plants in the garden. The tall pine trees that border the property provide a great backdrop for picture-taking. The featured birdbath was a gift from their daughter over 20 years ago, and was moved to this garden when they purchased the home. 4. Love Garden 419 Brewer Street. In 5 short years, the owners have brought in a variety of trees, shrubs, and plants that transformed this blank slate into a beautiful greenspace. Using perennials and annuals, as well as some unique re-purposed containers, this garden is a surprising cool oasis in the city. The public face of the garden displays three shapely crab trees and seasonal window boxes that thrive in the sun, while the backyard features a shade-loving landscape. 5. Franke Garden 410 N. Eagle Street. 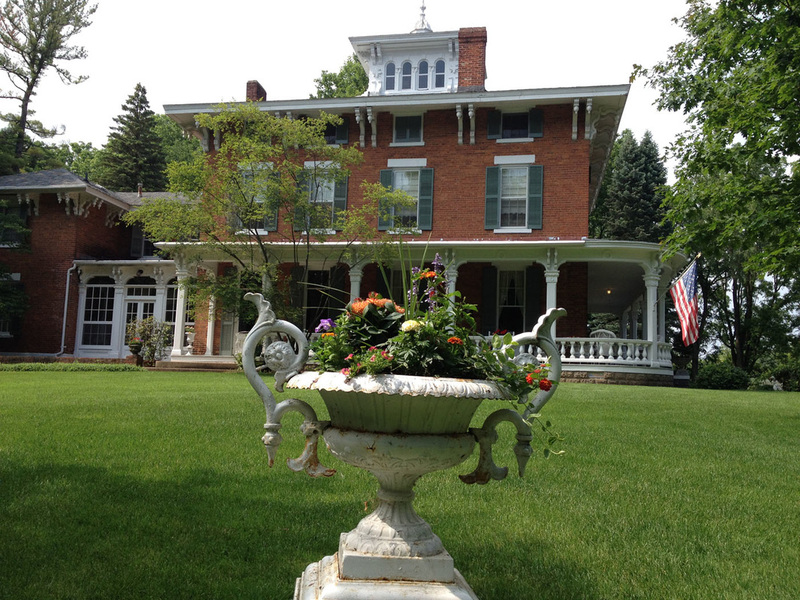 Stately oak trees surround this historic home and shelter your walk up the hill to the peaceful vista. Thirty years of gardening showcase the joys of mature plantings in this 30-acre park-like setting, known as “Oakhill.” The surrounding outbuildings, the Pub and the Playhouse, are beautifully landscaped, adding charm and whimsy to this grand home. Relax, stroll slowly, and feel like you are visiting a home from another era. 6. Overhiser Garden 215 N. Marshall Avenue. This 10-year old garden is a Hosta “Farm,” taking full advantage of this small city lot. The owner grows Hosta from seed and has registered some of his favorites. 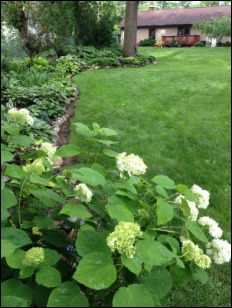 Other plants, shrubs, grasses, and statuary are located harmoniously in the landscape. Specimen trees include Ginkgo, Red Maple, Dawn Redwood, Red Bud, and Paw Paw. A new water feature and sitting area has become the main outdoor rest and gathering space.